Battle of the Bulge for iPad: Update Coming Tomorrow – New Scenarios! 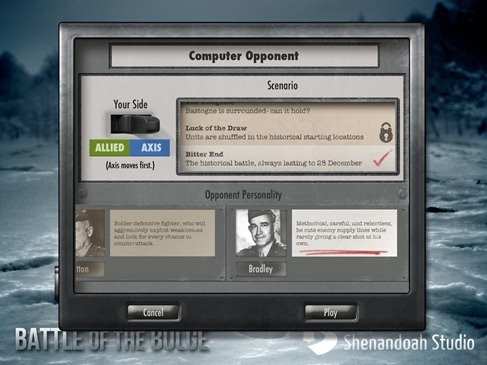 Battle of the Bulge is a historical wargame, designed specifically for iPad. It’s a turn-based simulation in the spirit of traditional board wargames. Pieces represent actual military units fighting on the terrain of the famous WWII battle. “End Game’ – $3.99 – depicts the historical counterattack by George Patton that relieved the siege of Bastogne. 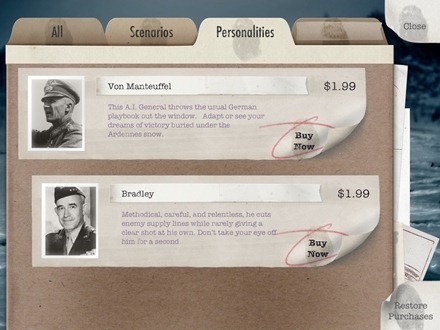 ‘Luck of the Draw’ – free – resets the historical campaign game with a random setup and altered reinforcement schedule. ‘Bitter End’ – free – enables the historical campaign game to be played to the end of the last day of the historical battle, regardless of how well or badly either side is playing, with the possibility of a draw. And, as thet say on TV ads, there’s more. New features will include an expanded list of Game Center achievements and two new biographies. I’ve mentioned here many times how much I love this game, and I included in our Best iPad Apps of 2012 list. Tomorrow’s update will add some top user requested features and extends the game with the new scenarios and opponents to battle against. It’s always great to see stellar apps that keep improving and I can’t wait to try out the new updated Battle of the Bulge tomorrow. The update is expected to hit the iPad App Store at around 4:00PM Eastern. Here’s an App Store link for Battle of the Bulge; it’s priced at $9.99. Excellent news. Also in app purchase gives me the opportunity to continue to reward the developers for producing such a great game. Bring on Alamein! Phil – absolutely agree on rewarding / supporting the developers and of course on looking forward to El Alamein and more great wargames for the iPad.